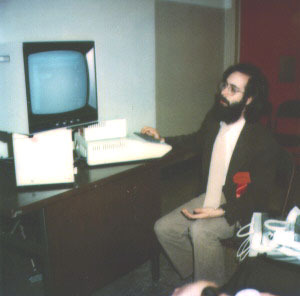 VisiCalc was first shown to the regular personal computer press in a special room at the West Coast Computer Faire in San Francisco in May of 1979. Personal Software invited various people up to see it, as well as other products they were considering publishing. It was here that I first met Vern Raburn, who later went on to Microsoft, Symantec, and then co-found Slate Corporation with me and others. < Previous Page Next Page > For more History see the book Bricklin on Technology. © Copyright 1999-2009 by Daniel Bricklin. All Rights Reserved.